The Reel De Luxe Video Slot Review - Casino Answers! The Reel De Luxe is a 5-reel, 25-line video slot developed by Slotland Enterainment, featuring a wild symbol, scatter wins, discounted spins, a bonus game and a progressive jackpot. 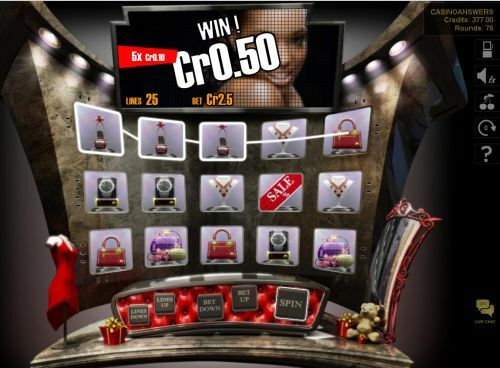 You can play the Reel De Luxe video slot at Win A Day Casino. Bets on the Reel De Luxe slot machine are $0.02, $0.05, $0.10, $0.25, $0.50, $1, $2, $3, $4 or $5 per line. You can select up to 25 paylines on the Reel De Luxe video slot. You can bet anywhere from two cents per spin up to the maximum total bet of $125 per spin. 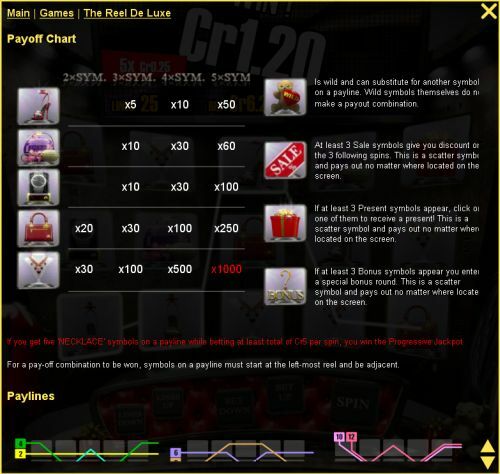 The Reel De Luxe online slot has a good betting range that is suitable for most online casino players. To play the Reel De Luxe video slot, select your bet and press the “Spin” button. The Reel De Luxe video slot has a progressive jackpot. The jackpot is currently at $54,047. To be eligible to win the Reel De Luxe progressive jackpot, you must make a total bet of $5 or more. In order to win the progressive jackpot, you must get 5 Necklace symbols on an active payline. If you’re not making a bet of $5 or more, you will instead win the 1000 coin top fixed payout. To try and win the Reel De Luxe Progressive Jackpot, you can play at Win A Day Casino. The Teddy Bear symbol is wild and will substitute for any other symbols on a payline. Teddy Bear wild symbols require other symbols to form winning combinations. The Present symbol is a scatter symbol on the Reel De Luxe video slot. If three or more Scattered Present symbols appear anywhere on the reels, you will be awarded a scatter win. Click on one of the Present scatter symbols to win a prize of 2X or 500X your total bet. If three or more Sale symbols appear anywhere on the reels of the Reel De Luxe video slot, you will get a discount of between 10% and 100% for your next three spins. If at least three Bonus symbols appear anywhere on the screen, you will trigger the Reel De Luxe Cash bonus game. The game symbols will replaced with question marks. You can select three of these question mark symbols to win up to $500 per symbol. If a “Sold Out” sign appears, the bonus game will end. You can win up to $1,500 on the Reel De Luxe bonus game. The Reel De Luxe video slot has a basic autoplay mode that you can use to play many spins with minimal effort. Click the arrow symbol near the top right part of the screen to open up the autoplay mode options. You will be able to select 5, 10, 25, 50 or 100 autoplay spins. You can speed up the gameplay by skipping animations on winning combinations. Triggering any feature will bring the autoplay mode to a halt. You can stop the Reel De Luxe autoplay mode at any time by pressing the autoplay mode button. The Reel De Luxe slot game has some interesting special features that fit in well with the shopping spree type theme. You can also play for and win the Win A Day Progressive Jackpot by playing the Reel De Luxe video slot. The main negative of the Reel De Luxe video slot is that the bonus game and discount spins features are both very difficult to trigger. You can play the Reel De Luxe slot game when you sign up and make a deposit at Win A Day Casino. Can players from the United States play the Reel Deluxe online slot game? Yes, USA-based players can play the Reel De Luxe video slot for free or for real money at the USA-friendly Win A Day Casino. Do I need to download any casino software to play the Reel De Luxe slot machine? No, there is no casino software to download at Win A Day Casino. You can play for free or real money. For the best performance possible, make sure you have the most recent release of Adobe Flash Player.